Note the year of release - this isn't the famous Rankin/Bass stop-motion special, but rather a short directed by Max Fleischer. It's only about 8 minutes long, and it's an earlier adaptation of the song. 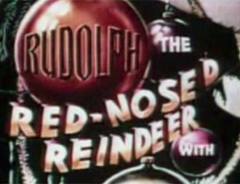 I've known for a while that there were multiple versions of Rudolph out there, but somehow I missed that this was directed by Fleischer. If you're not a big fan of animation, he's the guy responsible for the Popeye cartoons, as well as the extremely influential Superman animated shorts. His take on Rudolph is, if nothing else, extremely bizarre. The story starts with Rudolph shunned for his nose by his peers, as you'd expect. What I didn't expect was the level of anthropomorphism used. These Reindeer walk upright, live in houses, and speak. The coach's whistle in the Rankin/Bass special seems realistic in comparison. In fact, Santa's the only human in the short. He comes across Rudolph when he's dropping off gifts in his town then enlists him on the spot. After delivering gifts to the deer, they head to drop off presents to a city of rabbits. The writing's nothing special, and some of the designs are off-putting, but there's no denying the animation itself was revolutionary.